Join and spread the word about a two-day telephone protest against fracking at Leith Hill in Surrey, UK on September 27-29 September 2017. 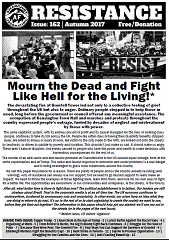 The Autumn 2017 16 page issue of our free paper Resistance is out in print and available for free download. Why the British elite is losing it’s sense of control, and what that might mean for the rest of us.